Super Savings Item! Free Shipping Included! 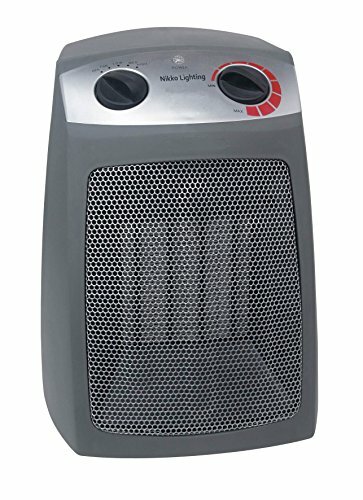 Save 37% on the Nikko Heater (UL LISTED) - 5200 BTU - Auto Temp Control - Over Heat Protection - Tip Over Protection - Dust Filter - Rear Cool to Touch by Nikko Lighting at KXSH 365. MPN: Nikko 168. Hurry! Limited time offer. Offer valid only while supplies last. The average lifespan for an INFARED HEATER is around 6000 hours or less, roughly 4-8 months, the quartz infared bulbs are a big hassle to change. The average lifespan for an INFARED HEATER is around 6000 hours or less, roughly 4-8 months, the quartz infared bulbs are a big hassle to change. With the Nikko 168 ceramic heating element, there are no bulbs to be replaced. The Nikko 168 heater core is completely sealed from the ceramic heating element, the inside wire components will get up to 100 F. The core of the heater is sealed and rated and protected at 1000F. The wires will not get hot. The Nikko 168 heater will emit on High Heat 256 F. In a rare event of a power surge or overheating due to blockage, the heater has an Automatic thermal shut off protection. Another safety feature is the automatic shut off tip over switch, when the heater is tilted over at a 45 degree angle. Supplement your heating needs, the Nikko Safe Ceramic heater provides warmth and comfort for the use in a office or room. NOT RECOMMENDED FOR OPERATION IN A WET OR DAMP AREAS (BATHROOM). We are the only 2 manufacture that passed the Underwriters Laboratory Safety Compliance (UL LISTED) / Safe Ceramic Heater Design. Nikko Lighting maintains a strict guideline on quality control during production and after production. We guarantee all components assembled to manufacture the Nikko 168 is UL Listed. The power supply cord is insulated to withstand 300 volt current /temperature 212 degree Fahrenheit and the motor lead wire is rated at 600 volt / 212 degree Fahrenheit. (Our wiring components do not get hot.) (Electrical conduit system should comply to National Electrical Code: Breaker box rated at 20 Amps and 12 Guage wire rated at 194 Degree Fahrenheit.) If your heater is not UL LISTED, do not buy it. Our factory is an ISO Certified Manufacture. UL LISTED-USA / CANADA = SAFE QUALITY DESIGNED NIKKO 168 CERAMIC HEATER. WHILE SUPPLIES LAST!!! If you have any questions about this product by Nikko Lighting, contact us by completing and submitting the form below. If you are looking for a specif part number, please include it with your message.